Nielsen’s 2017 report reflects the same trends that were highlighted by researchers and big data throughout the year. Streaming is becoming ever-more securely entrenched as the foundation for today’s music industry, with growth in both consumption and sales. Total consumption of music across formats rose 12.5% for the year, reaching 636.6 million units. That figure includes video; total consumption of just audio increased 10.2% to 491.5 million units. 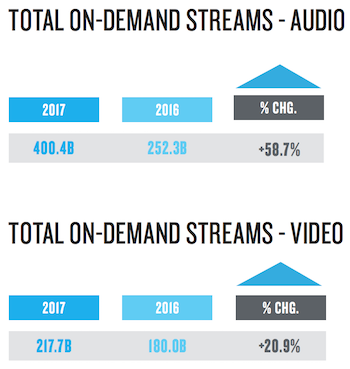 Streaming helped drive that growth, with total on-demand audio streams rising 58.7% for the year to 400.4 billion streams. Total on-demand video streams increased 20.9% to 217.7 billion. Total album sales fell 17.7% for the year, moving 169.1 million units. Digital downloads posted the larger decline, 19.6%, while physical album sales dropped 16.5%. Vinyl continued its incremental annual rise, up 9% to 14.3 million units. Nielsen also detailed the strong individual artist performances, which reinforced the impact of streaming. Drake held onto the top artist spot, followed by Kendrick Lamar and Ed Sheeran. Future, Post Malone, and Lil Uzi Vert, all rap acts with a heavy digital focus, also made the top 10 artists. 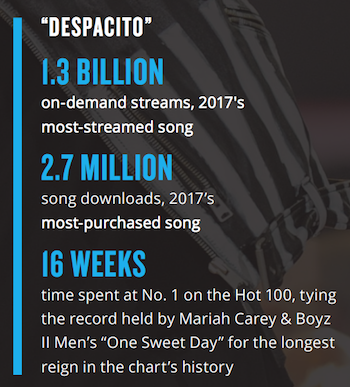 Smash single “Despacito” was the top song for several charts: digital song consumption, on-demand streaming, audio on-demand streaming, video on-demand streaming, and digital song sales. This Latin music crossover was a huge hit on YouTube that got an additional crossover boost when released with a guest chorus from Justin Bieber. By Nielsen’s accounting, “Despacito” amassed 1.3 billion streams and 2.7 million song downloads during the year.